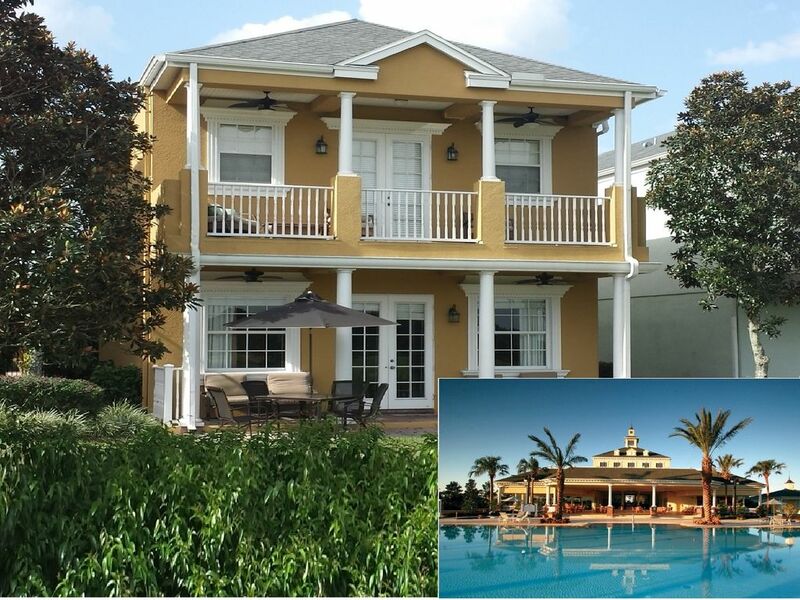 Casa luxuosa com piscina, 4 suites, linda vista a 10 min dos parques da Disney. Belissima e luxuosa casa, decorada profissionalmente, com 4 suites e piscina privativa com banheiro exclusivo, localizada no famoso Reunion Resort. A casa está situada no Fairway de No. 17 do prestigiado campo de golfe Arnold Palmer e possui uma vista soberba desse campo e do Hotel Reunion Grande. A propriedade, que está localizada a 30 minutos (45 km) do Aeroporto Internacional de Orlando e 10 minutos (8 km) da Disney, oferece acomodações amplas e confortáveis para 10 pessoas. Reunion Resort é um condomínio fechado de cinco estrelas com segurança 24 horas. Dispõe de 10 piscinas, seis jacuzzis, um spa, dois parques infantis, três restaurantes, um sushi bar fabuloso e três campos de golfe de grife: Tom Watson, Arnold Palmer e Jack Nicklaus. A casa principal tem ar condicionado central, uma cozinha totalmente equipada e três suites. Todos os quartos possuem ventiladores de teto. O nível superior tem um quarto de casal com uma bela varanda com vista maravilhosa para o campo de golfe Palmer, cama tamanho king e uma banheira de hidromassagem no banheiro. Também no nível superior, você encontrará uma suite com duas camas de solteiro e uma varanda com vista para a piscina. No andar principal tem uma suite com cama de casal tamanho queen. O apartamento em cima da garagem tem uma entrada privativa e possui uma suite com cama de casal tamanho queen, uma sala com sofá-cama tamanho queen e uma área com mesa, microondas e geladeira. A propriedade também possui lavadora e secadora de roupas, Internet grátis, e telefone com chamadas gratuitas para qualquer lugar dos EUA. Para os mais pequenos, também temos disponível um bercinho desmontável, cadeirinha para comer e carrinho com guarda-chuva, sem nenhum custo adicional. A piscina privativa não é aquecida, mas a temperatura da água é muito confortável, de abril a outubro. Outras piscinas do condomínio são aquecidas e estão disponível para o seu uso durante todo o ano. Check-in: 14 hrs, Check-out: 10 hrs. É extritamente proibido fumar na propriedade. Animais de estimação não são permitidos. Churrasqueira dispónivel mediante solicitação e pagamento adicional de taxa do gás e limpeza. Nossa casa tem uma das melhores vistas do Reunion Resort -- se não for a melhor. Dela você poderá ver o privilegiado campo de golf Arnold Palmer e o Hotel Reunion Grande. Essa vista maravilhosa pode ser disfrutada da varanda do andar principal e da sacada do quarto de casal no primeiro andar. Aqui você encontrará serenidade e tranquilidade. A casa está localizada no prestigioso Reunion Resort, exatamente no 17o. Fairway do campo de golfe Arnold Palmer e com segurança 24 horas. Bercinho desmontável, cadeirinha para refeição e carrinho com guarda-chuva estão disponíveis para o seu uso sem custo adicional. 100% reembolsável se cancelado com antecedência de pelo menos 60 dia(s) antes da data de chegada. 50% reembolsável se cancelado com antecedência de pelo menos 30 dia(s) antes da data de chegada. Very clean, well-situated golf course view home in the lovely reunion community. Lots of golf activity to amuse right outside the French doors. Comfortable, nicely appointed and at a very reasonable rate for the size and excellent location. We enjoyed a month long rental which flew by. Disney and Celebration are only minutes away. We dined out often at all the Disney venues and also enjoyed Eleven Steakhouse in the Reunion Hotel. Their peanut butter dessert was sublime. Our daily walks were very enjoyable, everyone was super friendly and we saw lots of exotic birds, including frequent visits from the sandhill cranes. So neat! The owner was nice enough to checked in on us and to make sure we were happy and yes we truly were! Thank you for sharing your lovely villa with us. We hated to leave and truly hope to return soon. The house was very spacious and clean. The mattresses and the pillows were very comfortable...however, the overall temperature inside the house was hot. The thermostat was set to 75 f but it felt warm during the day time. It would have been nice to be able to regulate the thermostat. On our last day the washer machine flooded but I understand things can break. Sorry we did not earn your five star review, particularly because we did not know you where having issues operating the thermostat. Otherwise we could have stopped by the house and shown you how to change the temperature manually. Temperature can be changed at will manually on both floors and the apartment independently. Looking forward our next opportunity, I thank you very much for your stay and feedback. Our family of five enjoyed our stay. Very comfortable home. I gave it five stars because the rental fee was very reasonable, the home was very nice and spacious for the rental fee, pet friendly and had its own pool. Owner was easy to contact. This is our first time staying at this property. It definitely met our needs. We loved having a private pool. The home was spacious. The bonus room above the garage was perfect for our 20 year old. Our only issue was the air conditioner. We couldn’t get it cold enough upstairs. Overall we would recommend this property. Only one word to describe it.....PERFECT! My family and I stayed in this beautifully decorated, spacious home for 6 nights 7 days during my daughter’s basketball tournament. All I can say is that it was perfect! It was very clean, well maintained, located in a quiet community, has a great view from the master bedroom and living room, the pool is fantastic, bath and pool towels were provided and the kitchen has everything you need to prepare a meal. The only thing you will need to bring with you are clothes, personal items and food. This home is located within a 10 minute drive of Walmart and many, many restaurants. It’s also only a 15 drive to Disney World and ESPN Wide World of Sports. Located in Reunion is “The Cove” which has a nice pool and poolside cafe. It also has an arcade. So it was a great place for the kids to meet, play and eat while parents layed poolside and had a beverage. The only thing that would make this property even more perfect and convenient, is if rental guests could enter the community through the back gate, especially since this lovely home is less than 25 yards from the back gate. The only issue we had during our stay was with the AC, however, Dee and Steve (property management) were very responsive and promptly resolved the problem.The owner, Marco, is also very responsive and accommodating. We loved our stay in his wonderful home and hope to book/stay there next summer during the basketball tournament. This is a very nice home, in a great neighborhood. Home was clean, comfortable and private. Location was great, as well. Close to grocery shopping and all activities. You can see the fireworks at Disney from the upper balcony at night. We would definitely consider renting in the future. Nossa casa está localizada no condomínio fechado com segurança 24 horas do Reunion Resort. Da casa, você tem uma das melhores vistas do Reunion Resort, podendo apreciar o campo de golfe Arnold Palmer e o Hotel Reunion Grande. No Resort, você encontrará 10 piscinas para você desfrutar com sua família, quatro restaurantes, um spa, um parque aquático, três campos de golfe de grife, parques infantis, e muito mais a poucos passos da casa. A casa está a 15 minutos dos parques da Disney, a 20 minutos do Sea World e Universal, 30 minutos do Legoland, a 15 minutos de uma das melhores shoppings da área de Orlando/Kissimmee, e a 45 minutos da praia de Clearwater. Check-in: 4:00P; Check-out: 10:00A. Barbecue grill available upon request for a fee to cover propane and cleaning. Smoking and pets are not allowed.